The habaki is the heart of the sword. 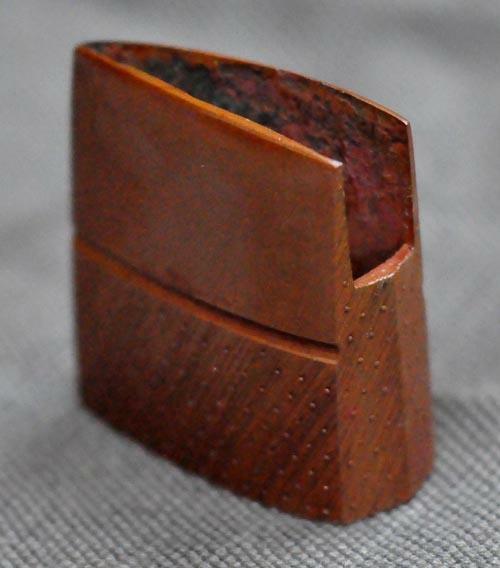 It transfers the shock of cutting to the outside of the tsuka, rather than allowing it to go through the mekugi. A badly fitting habaki is therefore dangerous. It can, over time, so stress the mekugi that it breaks. If this happens during practice, you may have the highly dangerous situation where the blade leaves the tsuka and flies across the dojo. Since a ready made habaki is unlikely to exactly fit your sword, and was not made specifically for it, we do not sell them. Our habaki are handmade in the traditional way to fit your sword exactly. They can be either single or double, and made in copper, silver, or gold, and probably shakudo, or foiled in silver or gold. A variety of decorations are also possible. We can additionally duplicate a broken or damaged habaki. We will however need your sword to ensure that the habaki fits properly. See Restoration Services for prices.